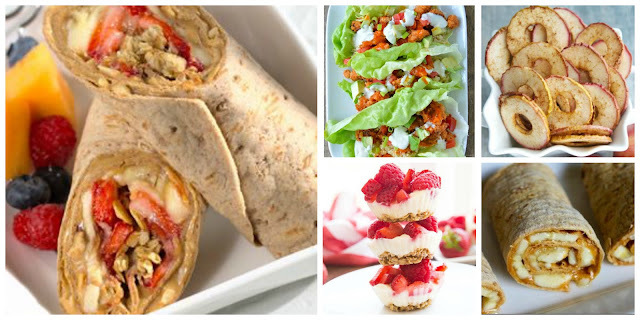 Stay healthy in-between a round of basketball with these ten delicious snacks. 1. Peanut Butter Banana and Honey Roll Ups: This tasty snack will keep you energized on the court. All you need is four ingredients and in less than five minutes whip up this snack. With a drizzle of honey on top this delicious treat will leave you desiring more. 2. Cinnamon Apple Chips: During a morning warm-up eat up this snack that has one of the easiest recipes. Simply core some apples, then slice them into circles, toss cinnamon and sugar, then put them in to bake. Play a one-on- one match, and after earning twelve points, 4 rebounds, and 1 steal enjoy a bowl filled with these savory fruity chips. 3. Frozen Yogurt Berry Bites: As the heat rises while shooting an ace on your Sport Court Putting Green, eating fro-yo berry bites will freshen up your day. This is the perfect snack to eat during your opponent's turn out on the green. Offering four grams of protein, fro-yo berry bites will help you unleash the perfect back swing into a hole-in- one. 4. PB and J Banana and Granola Wrap: Tired of grabbing your child fast food before practice, this snack requires little preparation. Peanut Butter rich in protein and potassium is a healthy snack that will help you pivot to a winning lay up. You can add other tasty fruits such as strawberries, kiwi, and pineapple to this snack as well. Only takes three easy steps, spread, wrap, and enjoy. 5. Buffalo Chicken Lettuce Wraps: Have a fulfilling lunch grabbing this delicious wrap during a halftime break. Buffalo Chicken Lettuce Wraps are protein-rich, and lightened up with some spicy deliciousness. This snack provides you with the momentum for a playoff game. Live a healthier lifestyle playing on a Sport Court Game Court, while the entire family savors these snacks off the court.